The BBC has launched Terrific Scientific. The aim is to encourage primary school children to learn more about DIY experiments they can try out at home (with some adult supervision!). 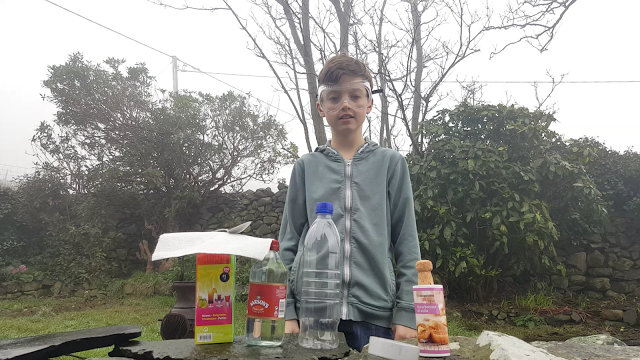 We attempted the DIY Bottle Rocket to show how easy it is to get anyone involved in science. Eldest was only too keen to don his safety goggles and get stuck in. You can watch our little video below. It includes everything you need to make your very own DIY Bottle Rocket. You do not need anything complicated to get involved. Perhaps you already have everything in your kitchen cupboards or can pick them up inexpensively enough! The BBC wants the experiments to be accessible to all. So yes we definitely had a few teething problems with our DIY Bottle Rocket! But we managed to get the grand launch finally. Then it went REALLY high only to not get the footage we wanted as it all happened too quickly for the supervising adult to film! You can see how long it takes to drop back to the ground though which gives you some idea that it went MUCH higher that last time. Eldest said, “that freaked me out!”. He couldn’t get over how far it went. It was frustrating when we didn’t manage to get the experiment to work but perseverance paid off. Getting involved with science is fun and educational. It’s fabulous having the Terrific Scientific at Home online hub to give guidance and inspiration about different experiments you can try. Why not try one of the activities over the holiday with your own children? We will certainly be attempting more over the half term holiday. Who knows you might turn your child into a budding scientist! You can also buy sets that include everything you need if you enjoy experiments. One example is the Wild! Science Kit that my boys really liked. Amazing kid.. 🙂 It’s a great way to encourage the kids to take part in science experiments. loved it.